What is the difference between drying and curing for conformal coating? The first point to realise is that there is a difference between drying and curing in conformal coating processing. This can be very important from a reliability point of view. Drying. Conformal coating drying is where the printed circuit board is coated and is fit to be handled by the operators. This may only be a few minutes after application or it could be several days later. It depends on many factors. Curing. Conformal coating curing is where the optimum properties (electrical, mechanical) of the conformal coating are reached for full performance protection to the circuit assembly. When viewed from this perspective, clearly it can be seen there is a fundamental difference between drying and curing of conformal coating. Why are drying and curing important? Drying and curing are very important when considering the processing of a conformal coating and the long term reliability of the product and circuit board. As previously defined in the Classification of Conformal Coatings Section, there is a significant difference between drying and curing. Drying is a property a solvent based acrylic conformal coating shows. The acrylic resin does not polymerise (does not cure) and actually just dries out with time as the solvents evaporate. This means the conformal coating can actually be re-dissolved back up in the evaporated solvents and reform the coating. Other coatings can dry initially but they also cure in time. Other types of conformal coatings actually cure. That is they cross-link by one of the many available methods including heat, UV, moisture and catalysed cure. This provides the chemical resistance for which they are generally selected. When considering conformal coatings, there are three stages that are useful to consider. Note, that for all three stages of conformal coating this is independent of the type of coating used. What factors influence drying of conformal coating? Solvent evaporation rates. The boiling point of the solvents are a first order affect on the speed of the coating drying. Ambient conditions. The atmosphere around the drying circuit board can really affect the speed of drying. The key factors include temperature and humidity. Wet film coating thickness. Clearly, a thicker coating will dry slower than a thin coating due to the volume of solvent required to evaporate. Extraction rate / air flow. The air flow around the board makes a difference in the speed of evaporation. The more air flow that there is the faster the speed of drying. There are other factors that can affect the conformal coating drying. However, the main affects are listed above. What are the different cure mechanisms for conformal coatings? There are many different cure mechanisms. Heat Cure: Conformal Coatings that cure in elevated temperatures. Normally, coatings do not begin to cure unless they reach the required temperature. They are also normally much faster cure than room temperature cure. Moisture / Condensation Cure: Conformal Coatings that cure with ambient moisture in the atmosphere or condensation in the cure system. The volume of moisture in the air affects the rate of cure. 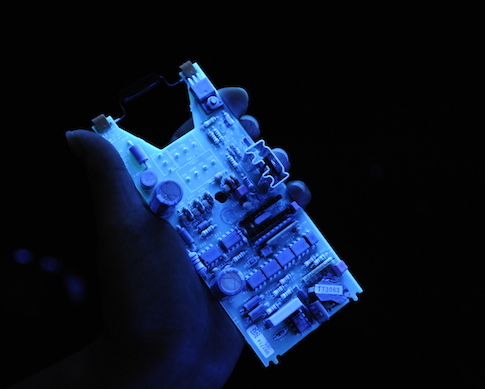 UV (Ultraviolet) Cure: Conformal coatings that cure with UV light. The light wavelength and energy influence the rate and ability of the coating to cure. Typically, UV cure coatings have secondary cure mechanisms to ensure any coating not cured by the UV light will eventually cure. Oxidative Cure: Conformal coatings that cure by means of atmospheric oxygen. Normally, the drying process occurs first as many oxidative cure coatings are solvent based. Catalytic Cure: These are two part material conformal coatings that are combined together to begin the reaction and cure. It is normally not possible to stop the cure process once combined. Does it matter if a conformal coating is not cured completely? This is a really good question to ask and is not meant to be taken lightly. However, perhaps a better way is to consider the above along with another perspective. Do you need to fully cure the conformal coating on the production line? A typical polyurethane conformal coating is used in an application process. According to the material technical datasheet the conformal coating requires a cure time of two hours at 90°C to reach its optimum properties. However, this can cost a lot of money in curing equipment on a production line and could be impractical for selection of the conformal coating in a high volume environment. Does the coating need to reach 90°C to actually achieve its optimum properties in the short-term for the production line or for the long-term reliability of the circuit? This is a crucial point for many conformal coatings and can easily be misunderstood. The first type of conformal coating will reach their optimum performance in time regardless of the production process and the conditions in which it is stored (assuming standard conditions of course!). This coating DOES NOT NEED to be fully cured coming from the production line if the circuit is not going to be exposed to the harsh conditions immediately. Therefore, the coating only needs to be dried enough to handle, test and package. In time it will reach optimum performance on its own. The second type of conformal coating is very different. It will never reach its optimum performance over time unless it is exposed to the correct cure mechanism. This conformal coating does need to be fully cured coming from the production line or there could be long term failures. Don’t cure it properly at production and it may never give the circuit board the right level of protection needed. A good example of a conformal coating that will reach its optimum properties eventually in ambient temperature conditions is a solvent based acrylic. Therefore, with time it will reach its optimum properties.